In old stories, a crossroad is always a magical place of power and choice. You never know who you might meet at a crossroad. Perhaps a lean, handsome peddler will draw up a cart and spread his wares. Other travelers may appear. Elders may linger there with wisdom under their tongues. Crossroads are not always identified by neat, straightforward lettered signs, but portents, omens and intuitive signs abound. A dismally croaking raven, a snake in the dust or a fleeting glimpse of a fox all have a message at a crossroad. I rarely miss posting weekly, but last week I did. I succumbed to a virulent upper respiratory virus and for a few days had no choice but to down tools and lie low. Simply breathing occupied all my attention and energy. I cancelled plans and obligations, abandoned my ‘to accomplish’ list and let go of my self-expectations. This was frustrating, as it was the week in which I intended to transition effortlessly from my old job to new possibilities, witness the smooth closing of the sale of my property in Colorado, and generally navigate these significant endings and beginnings seamlessly, elegantly, confidently and without mess. Instead, I emptied two boxes of Kleenex, coughed as though ready for an end-stage TB ward, achieved a spectacularly sore and chapped mouth and nose, drank liters of fluid with the inevitable day and night result of continually needing to pee, and tried to sleep in a sitting position to facilitate breathing through my clogged airway. Instead of transitioning smoothly into new work, I canceled one opportunity and didn’t follow up on others. I worried about money instead. The sale of my house did occur, but a day late due to unexpected last minute paperwork that needed to be signed and notarized and sent from Maine back to Colorado. My renters have been unable to find a new place, the buyer (now owner) is moving into a trailer because her old house also sold and her new house still has renters in it, and I need urgently to return to Colorado and retrieve the rest of my possessions from the property. In short, nothing about my internal, physical or external reality has been seamless, elegant, confident or without mess. In fact, there’s been quite a bit of mess, from sodden Kleenex to tangled feelings. None of this really surprised me. I’ve never yet been really miserably ill without a significant emotional event of some kind at the onset. I might not admit it intellectually, but the truth will out physically. Unacknowledged feelings eventually reach such proportions they demand my attention, one way or the other. All of my pretty plans didn’t allow for any space in which to pause, reflect, feel and be with how things are. 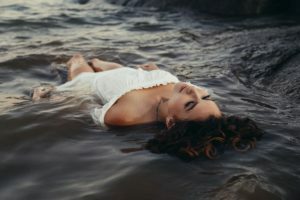 I resigned myself to the inevitable, did what I could for my symptoms, reread all my old Mary Stewart books (so comforting, and no brain required), dozed, and thought about intersections, endings and beginnings, suspended activity and crossroads. I have a tendency to view my experience through a lens of metaphor and symbol, and suspended activity has been much in my mind for the last five years. 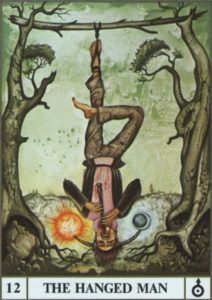 The Hanged Man is a Tarot card with just that meaning, and my first book is named after it. The Hanged Man is a card many people fear, although generally the figure depicted hangs upside down from one leg, apparently perfectly relaxed and comfortable and even smiling, depending on the deck. The card illustrates that place in life we’re all familiar with between one thing and another, just like the crossroad. Events converge and intersect. Meetings and partings take place. We suddenly come to the end of a road and it’s necessary to choose a new one. I’ve never been good at pausing. I can accept change, but I expect myself to adjust and adapt instantly and effortlessly, no pause required. I don’t want to hang around (if you’ll pardon the pun) and think about what’s over or what I’d like to begin. I want to get a grip and move on. Now! This is a shame, and all the old stories and archetypes tell us it’s counterproductive. Crossroads are sacred ground, filled with resting places, old altars and tilted gravestones. The leaves on trees growing at crossroads whisper all the prayers and petitions they’ve heard. At crossroads we lay out cards, cast runes and yarrow stalks, interpret dreams, drum, dance and call on our intuition and faith for guidance. A crossroad is a place to linger, honoring where we’ve been and considering a way forward, or sideways, or perhaps even retracing our steps for a second time before we go on. A crossroad deserves an offering of our presence and patience. It’s only in suspended activity that we access our deepest intuition and wisdom, only then when we begin to gain full understanding. Loss takes time to put to rest. Hopes and dreams need time to grow. 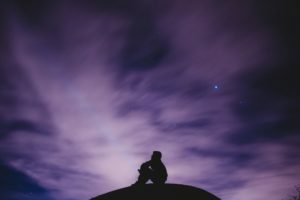 Intuition can’t speak unless we’re quiet, and guidance can’t find us if we’re not still. I’m writing this out on our deck in the sun. I can hear water running into the pond. The phoebe, back for another summer, is perched in her favorite spot on the barn roof, bobbing her tail and hunting for insects. Wonder of wonders, there’s not a box of Kleenex at my elbow! Not only that, but I’m breathing through my nose. Things are looking up. Before me is a new week. I’ve sort of given up on the seamless and elegant thing. It hasn’t been fun to be sick, but I’m grateful I was forced to pause. I didn’t feel like I was doing anything except wasting time and blowing my nose, but I see now I needed to hang by one leg and just be for a little while. I needed to consider what’s ending, and how I feel about it, and what direction I want to go now. I needed to spend some time wandering in my graveyard, remembering what’s laid to rest there. It was important to revisit my hopes and dreams, check in with my intuition and take time to wonder what will happen next. At this point I’ve decided to be content with lingering at this crossroad. When it’s time to go on from here, I’ll know. In the meantime, this is a good place. Maybe a peddler is even now on his way to meet me, or an old crone in a hooded cloak will come in the dark morning hours with an enigmatic message that will show me the way forward. Who knows? Now that this is written, perhaps I’ll go find the tree from which the Hanged Man is suspended and see what’s on his mind today. See my Good Girl Rebellion page for the perfect way to honor all those people who give so freely of their unsolicited advice. This entry was posted in Emotional Intelligence, Uncategorized and tagged altars, archetypes, beginning, change, choice, crossroad, dance, dream, emotion, ending, expectation, faith, fear, feelings, intuition, magic, metaphor, patience, pause, power, presence, sacred, stories, suspended activity, symbol, Tarot, the hanged man, wisdom on May 25, 2017 by Jenny Rose.